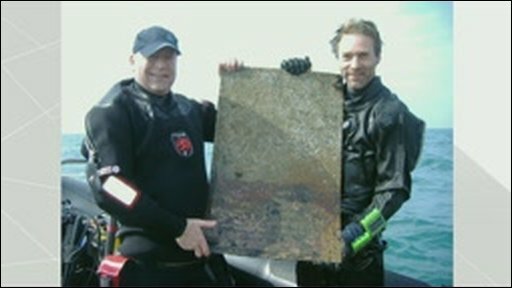 Jamie Smith, right, said the significant find was like "diving into history"
A plaque commemorating the deaths of Nottinghamshire soldiers has been returned to their regiment after it was recovered from a 97-year-old shipwreck. The brass memorial was aboard the SS Oceana bound for Bombay when it sank off the Sussex coast in 1912. It was found by diver Jamie Smith, who handed it back to the 2nd Battalion the Mercian Regiment at a special ceremony. The plaque names soldiers who died serving in India from 1819 to 1838. It will be displayed at Nottingham castle. Most of the regiment of 800 men, as well as many of their family members, died during the posting due to illness. Major Oliver Hackett said: "It's a very strong link to the past, which reminds us of the hardships our predecessors and their families had to undergo in an overseas posting." 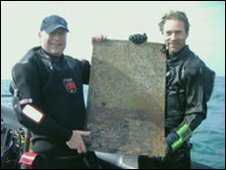 Mr Smith, of Tunbridge Wells in Kent, who uncovered the plaque in August, said: "When you go diving you go into history and when you find something as significant as this you realise it has to be done."